1/4 Ounce South African Krugerrand. The South African Krugerrand is produced by the Rand Refinery in South Africa and is one of the most popular gold bullion coins in circulation. The coin was initially issued in 1967, and by 1980 was the primary gold coin in circulation world-wide, accounting for over 90% of gold coins sold. 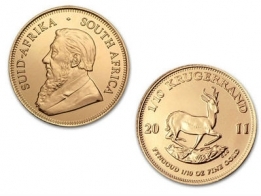 The Krugerrand was initially introduced in South Africa as a way for private individuals to be able to own gold. The front of the Krugerrand features and image of Paul Kruger, a prominent South African politician, and president from 1883 - 1900. The reverse of the coin features an image of a springbok Antelope, with the weight, fineness and year of mintage on it. 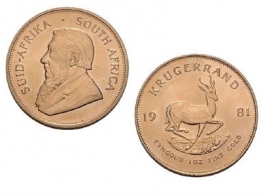 The Krugerrand gold coin has a slight copper tone. This is because the coin is mixed with some copper alloy in order to make it more durable. 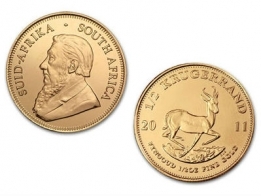 The South African Krugerrand gold coin comes in 1/10 Ounce, 1/4 Ounce, 1/2 Ounce and 1 Ounce sizes. In 2017 the Rand Refinery also introduced a one ounce silver Krugerrand and a one ounce platinum Krugerrand coin. 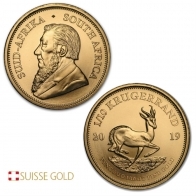 The gold Krugerrand coin is one of the most popular gold coins available in the precious metals market today, due to its low premium and recognisability worldwide. SuisseGold.ch buy gold coins from clients who are looking to sell gold Krugerrands also. For further information, please click here.